When discussing the musical impact of composer Richard Rodgers, serious students of popular song do not question his success or lasting influence. They may never agree which of his 900 songs is most important, nor which of his crowning achievements in musical theatre charted the direction of Broadway for decades to follow. Opinions vary on those topics, probably because almost any of the answers could be supported. 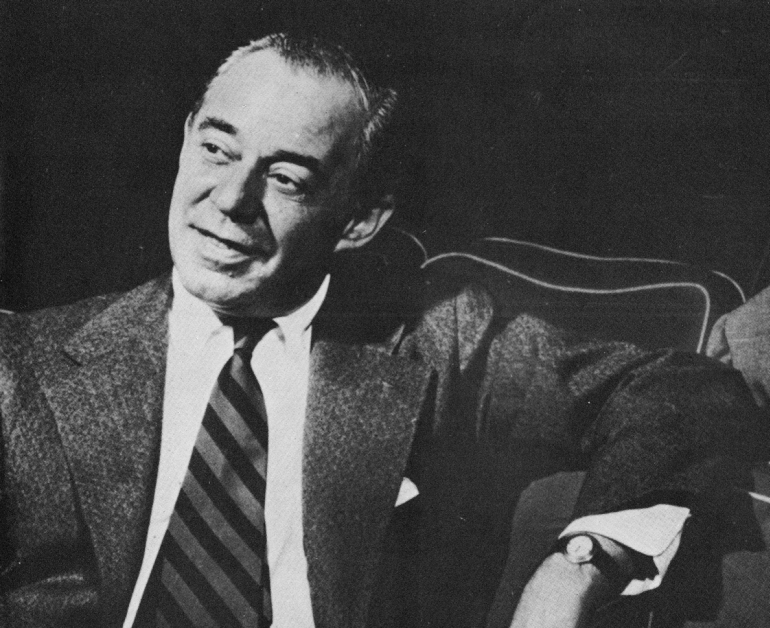 It is a much simpler question that draws the most passionate response from the armchair musicologist: Rodgers and Hart…Rodgers and Hammerstein…which combination had more of an impact on the American musical scene? The answer, really, is that Richard Rodgers is at the top of the list of iconic composers in the history of musical theatre, and arguably the entire realm of popular song. Richard Rodgers met Lorenz Hart in 1919 and the pair became a songwriting team almost immediately. Success, however, was anything but immediate. They started their career with the song “Any Old Place With You,” which was featured in a 1919 Broadway musical comedy. The team’s first professional production was Poor Little Ritz Girl in 1920. These forgettable affairs were followed by other, equally forgettable efforts until Rodgers and Hart first tasted success in 1925. The song “Manhattan” was one of a few they composed for a single-performance benefit show, but it received so much critical acclaim that the show was reprised and the feature tune became a huge hit. As dismal as their careers had been to this point, Rodgers and Hart suddenly enjoyed stunning praise and success. Following years of success and hard work on the Great White Way, Rodgers and Hart moved to Hollywood when the Depression hit during the 1930s. Living somewhat on past success, the duo more or less coasted along in Hollywood. Some of the hits included “Lover,” “Mimi”, and “Isn’t It Romantic?.” It is also noteworthy that the pair’s most lasting composition, “Blue Moon,” was created during their stint in Hollywood. They returned to Broadway in 1935 and immediately resumed their success. Songs from this period include “Where or When,” “My Funny Valentine,” “The Lady Is a Tramp,” “Falling In Love With Love,” “Bewitched, Bothered and Bewildered” and “Wait Till You See Her.” Success followed success until it became clear to Rodgers that Hart’s personal troubles were tearing the duo apart. The pair split in 1943, and although they had a brief reunion for a revival of Connecticut Yankee, Hart died shortly afterward. Knowing the end was near, Rodgers called on his old friend Oscar Hammerstein II, whom he had dabbled in songwriting with during his Julliard days circa 1918. Their first official collaboration was merely a show called Oklahoma!, which was the biggest leap forward in musical theatre since Porgy and Bess. Rodgers and Hammerstein followed the timeless Oklahoma with four shows that are simply overwhelming. These were Carousel in 1945, South Pacific in 1949, The King And I in 1951, and The Sound Of Music in 1959. There were a few modest hits and clunkers along the way, but in the context of five of the most significant musicals of all time, the others simply don’t matter. Sadly, Oscar Hammerstein II would pass away just after The Sound of Music opened, and never knew of its lasting success. “Edelweiss,” which was a late addition to the show, turned out to be his last song. Rodgers “borrowed” from Austrian waltz for the melody, but really “Edelweiss” is in every way an American original. Interestingly enough, many Austrian and German natives are convinced it is an old Austrian folk song! When all was said and done, Rodgers and Hammerstein racked up 35 Tony Awards, 15 Academy Awards, two Pulitzer Prizes, two Grammy Awards, and two Emmy Awards. One of the great Richard Rodgers compositions that really can’t be considered “popular song” is the score from “Victory at Sea”. Written in the early 1950s, this classical music showed just how talented Richard Rodgers really was. In the genre of American Popular Song, Rodgers’ biggest hit without question is “Blue Moon.” A version by Glen Gray & The Casa Loma Orchestra topped the charts in 1935, and The Marcels’s doo-wop influenced version rocketed to the top of the charts in 1961.